READY TO DITCH PROCESSED FOODS AND ENJOY A FRESH APPROACH TO EATING? From Apples to Zucchini, we guide you through the basics of growing, preserving and preparing pure, whole foods for healthy eating from garden to table. 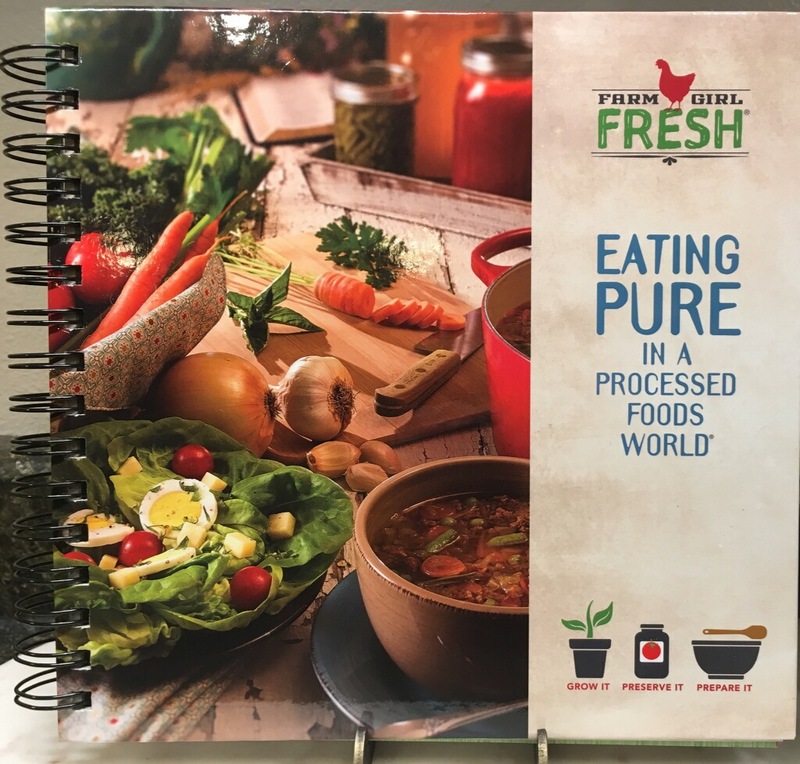 Thousands of people are benefiting from using our original printings of Eating Pure in a Processed Foods World ® . We recently released our revised second edition which has testimonials from health care providers and a few additional tips. The SECOND EDITION IS NOW AVAILABLE! FEELING TIRED? HAVE HEADACHES? IBS? CONSTIPATION? FOOD SENSITIVITIES? Modern processed foods are, literally, making us sick and overweight. Learn why and how to avoid the foods that can adversely affect your health, and discover the many benefits of home-style cooking by planning your meals around fruits and vegetables. Eating Pure in a Processed Foods World® contains over 300 gluten-free recipes. And many of these recipes can be modified to fit your individual needs including dairy-free, nut-free, keto and paleo. Our resource book is designed to help you turn back the hands of time and discover the original, healthy way of eating delicious, pure and natural foods. Click to sneak a peek inside! This garden-to-table book can also be used as a growing guide for the beginner or experienced gardener. It is packed full of gardening tips and step-by-step directions for canning, freezing and dehydrating to make use of fruits and vegetables when they are in season. Plus, you will enjoy the beautiful, mouth-watering photos throughout the book! Authors, Joyce Kaping and Colleen Anderson, have put their heart and soul into this book and share with you hundreds of healthy, tasty recipes they have created while on their own personal journey to better health as well as years of gardening and preserving experience. Their goal at Farm Girl Fresh is to educate and walk alongside individuals desiring to live a healthier lifestyle through food choices. “Grow it. Preserve it. Prepare it.” is the slogan that defines Joyce Kaping and Colleen Anderson’s book, EATING PURE IN A PROCESSED FOODS WORLD. More than the typical cookbook, EATING PURE overflows with their “fresh is best” philosophy of food and provides information on 39 fruits and vegetables, from raising them in the garden to serving them on the table. Farm girls Joyce and Colleen are friends “on a mission” to encourage others, especially the younger generations, to “get back to eating real whole food before they experience a health crisis.” The idea for their book grew from the success of teaching a pilot group of young mothers to cook as their grandmothers cooked – without processed food containing artificial additives and preservatives. The result is EATING PURE IN A PROCESSED FOODS WORLD, a treasury of practical advice in an engaging format. Colleen and Joyce have alphabetically listed produce from apples to zucchini in their 286 page book. Beautiful photographs throughout create mouth-watering appeal and present visual descriptions. Introductory pages are devoted to detailed lists of what they have found helpful, and the “why” behind “fresh is best” is explained. Definitions of common gardening terms and recommendations for gardening tools are included for those who wish to raise their own produce. Joyce and Colleen know that to prepare “better food for a better you” easily, necessary ingredients must be on hand. For that purpose, they suggest what to keep stocked in the pantry, refrigerator, and freezer. They also define basic cooking terms and list useful kitchen tools, as well as provide a synopsis of canning, dehydrating, freezing, and steaming procedures. Each produce selection begins with a full-page photograph of the product. On the second page, “How does your garden grow?” features a guide to planting, tending, and harvesting that particular plant. “Dig into this!” is a column of interesting facts and nutritional information. A Scripture verse ends the page for some spiritual nutrition. Next come methods for preserving and preparing that fruit or vegetable. “Helpful Hints,” indicated by an apron icon, gives tips for measuring that product for recipes, such as 1 ½ pounds of strawberries equals four cups and is about 48 medium strawberries. Every selection ends with a wealth of recipes, many of which do not call for gluten, dairy, or nuts as ingredients. EATING PURE IN A PROCESSED FOODS WORLD contains subjects as varied as making an organic fruit and vegetable wash, catching fruit flies, growing asparagus in the backyard, and pickling jalapeño peppers. Kid friendly recipes for easy snacks as well as fish sticks and chicken tenders are sure to please. Included are recipes to satisfy a craving for comfort foods like beef stew, baked beans, and tomato soup in addition to more unique taste treats like apple salsa, bacon and leek pizza, or roasted sweet potato chips. And when that special occasion arrives, the caramel coconut frosted carrot cake or raspberry lemon pie will top the celebration. I’ve used this cookbook for over a year and recommended it to anyone who would listen. A common sense approach to eating healthy makes it easy to use. As a gardener I love how it is laid out by vegetable/ fruit. I love the book. It holds all the information needed, from growing to table. My son-in-law is a big gardener and found his book very informative. I love Instant Pot recipes and hope that more will be shared. Keep it up. Great! We’re glad to hear you like the book. Thanks for your kind words.